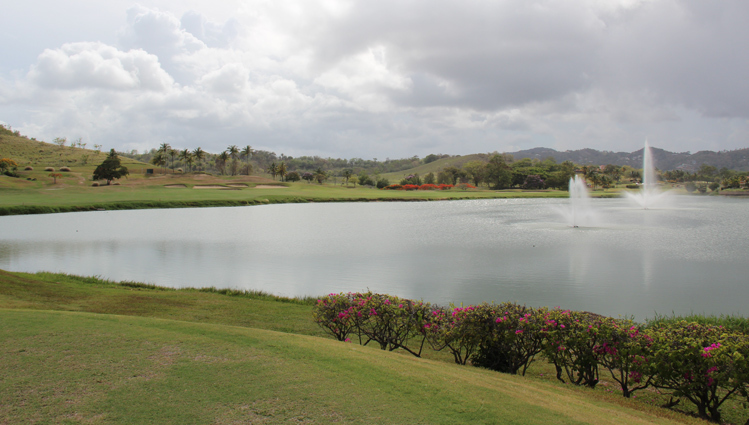 Palmas del Mar - Flamboyan Course Hole 3: This par five is a center piece of the course and is very visible from the main entry road. 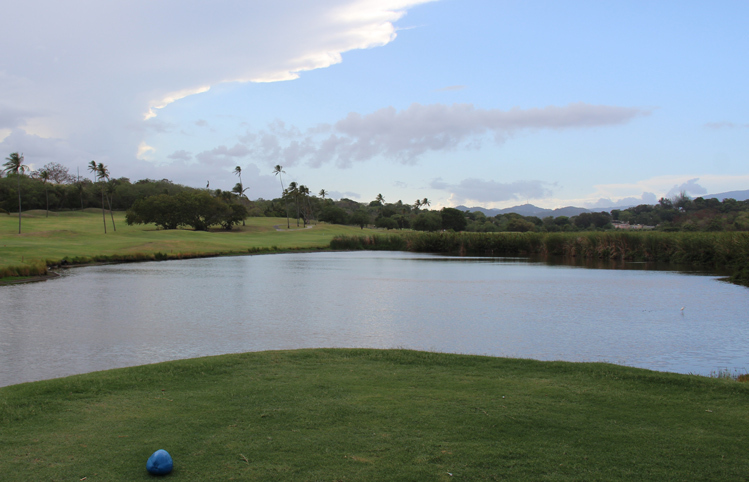 The drive has to fly the lake and the more to the right the player goes, the longer the carry that is required to stay dry. Bailing out too far left brings bunkers and small trees into play, however. The second and or third shots will also have to negotiate the water, which runs down the right side all the way to the peninsula green with water also behind its surface. Palmas del Mar - Flamboyan Course Hole 5: this straight par four also runs along the main entry road to the left, but also has a very large bunker on the right side. 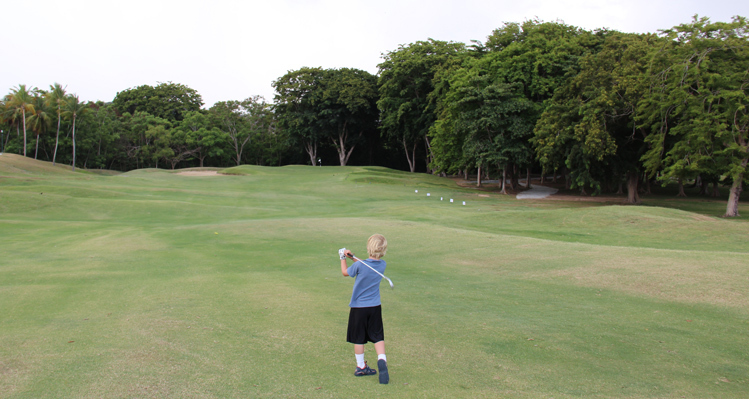 What makes the hole interesting are the very large pterocarpus trees that are common in Puerto Rico, but not usually in play on this golf course. 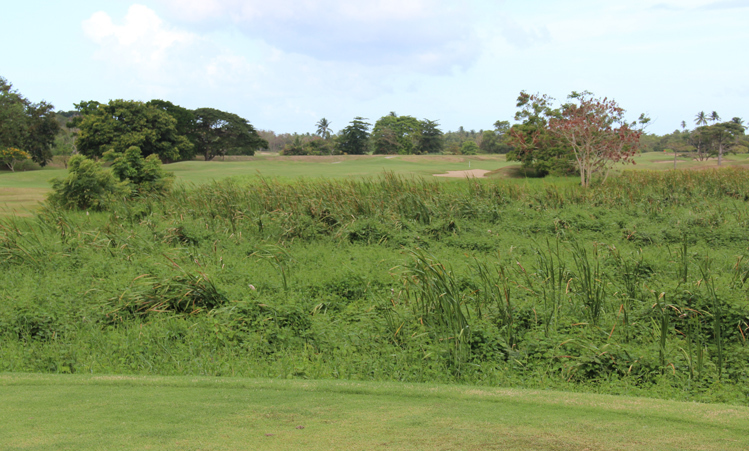 They frame the green, which also has four bunkers to contend with along the way..
Palmas del Mar - Flamboyan Course Hole 6: This par four is not particularly long, but it has a particularly vexing bunker that runs up the right of the hole. However, the second shot is the key one as the green is sandwiched between another bunker to the right and a lake to the left. 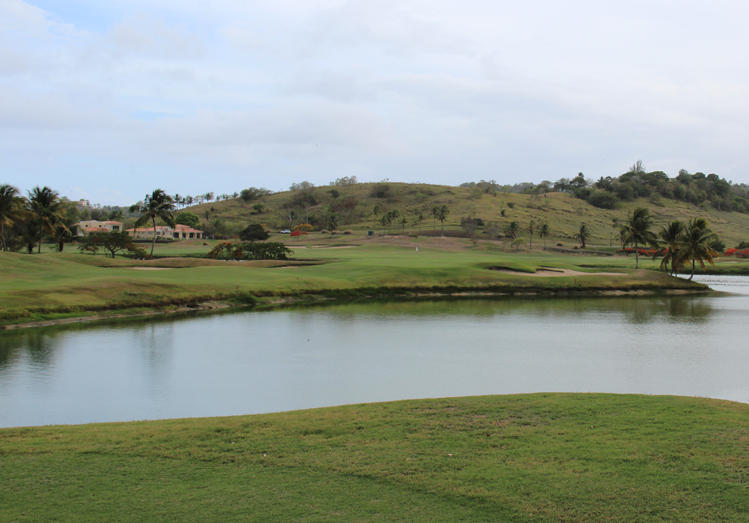 Palmas del Mar - Flamboyan Course Hole 8: This is a medium length par three with a water hazard being it's predominant feature. However, there is a lot of room around the green, including two large bunkers that will gobble up errant shots to either side of the putting surface. 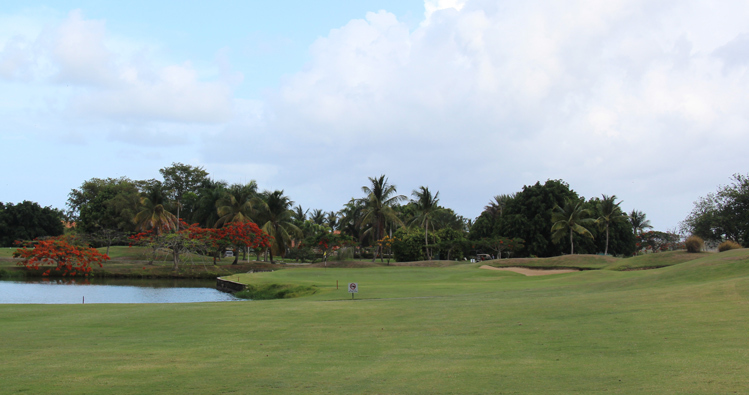 Palmas del Mar - Flamboyan Course Hole 10: The back nine starts with this dogleg right par five. 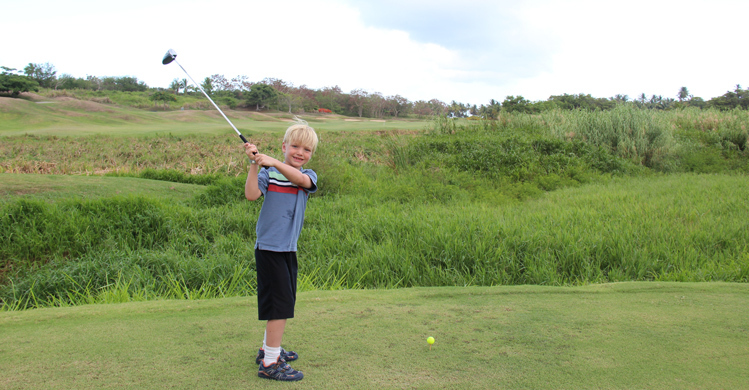 The ideal drive (but requires a good poke) is over or just inside the bunker at the right side of the fairway. the native grasses can be cleared easily, unless the shot is pushed far to the right. The green is then surrounded by seven bunkers with the only good bailout being short and left of the undulating surface. Palmas del Mar - Flamboyan Course Hole 11: This picture is taken from the white tees to give a better view of the hole, but from any of the longer tees from the right side of this picture, the shot is more blind over the hazard. The tee shot needs to stay right of the bunkers and left of the hazard and from there, the green is receptive. 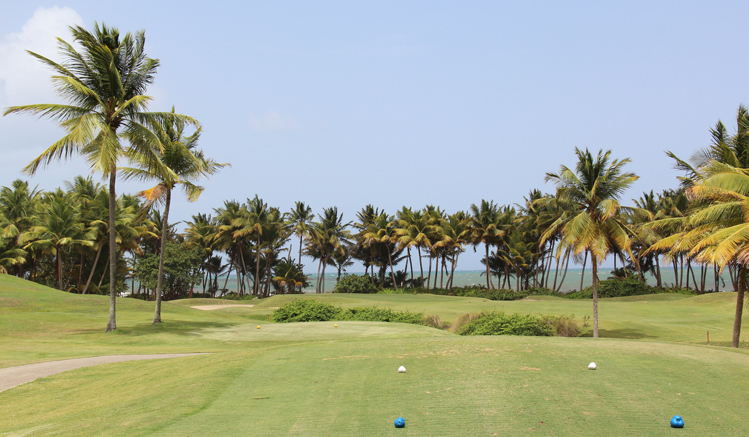 Palmas del Mar - Flamboyan Course Hole 12: This nice little par three brings the player down to the Caribbean with a ring of palm trees behind the green (don't go long) and behind that, the beach. The more immediate trouble are the bunkers on either side of the green, which is narrow, so being short-sided is a bad thing here for sure. 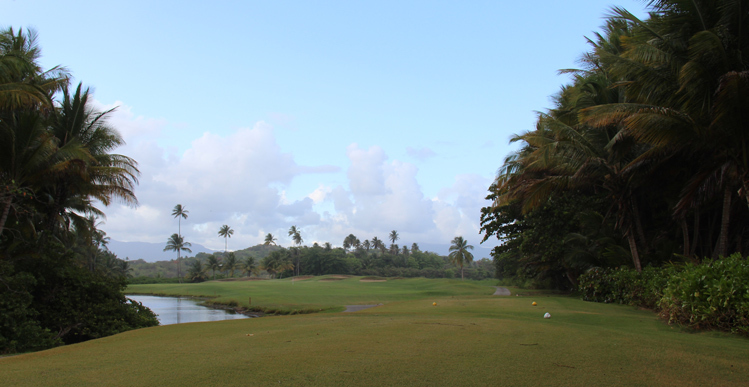 Palmas del Mar - Flamboyan Course Hole 13: This quirky par four is short, with a water hazard to the left and four bunkers right of the fairway. Not much club is needed but the second shot is over a little pond with a steep bank fronting the green, so coming in with a shorter iron is ideal, especially with the bunkers left and right of the green. Also, a drive that goes too far left may be blocked by trees as well. Palmas del Mar - Flamboyan Course Hole 14: Featuring a very difficult drive, this long par four has to be hit over the wetlands to the most narrow fairway on the course. Bailing out left is possible, but there are large grees with exposed roots that can make for some hand-breaking lies. The green is then nestled between a series of three bunkers to the left and the wetlands to the right. Palmas del Mar - Flamboyan Course Hole 18: After a brief lull in the excitement provided by the first half of the back nine, the adrenaline returns for the last shot of the day on this par four, which has a tiered green put between the sand trap complex to the right and the lake to the left.